Questions about our audio downloads? Check here. The three singers who influenced Corelli most were Del Monaco and Lauri Volpi for emission and Pertile for interpretation. (Franco once told me, “I copied my interpretation of ‘Ah sì! 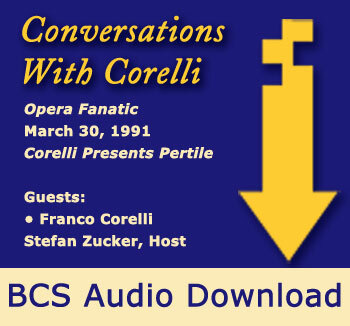 ben mio’ and the fourth act of Carmen from Pertile.” Listening to this program you get to share Franco’s perceptions of Pertile’s white-hot, pathos-scented and painterly art. Although this example is in Italian with me translating, Franco speaks more English on this program than usual. 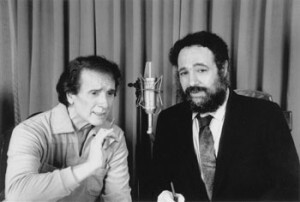 The noises heard intermittently during the March 30, 1991 interview leaked into WKCR’s studio from an adjacent auditorium and were picked up by the mikes. There is no way of both eliminating these noises and preserving our discussion. 4. Was Pertile a cripple? 5. Did you ever consider singing Wagner? 36. Did Corelli’s diminuendo involve falsetto? * The quality of actual downloads is better than that of the sample selections. See the note on the audio download information page.